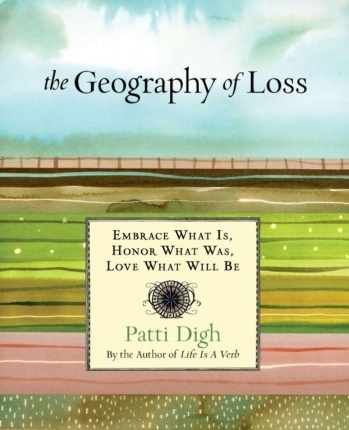 After far too many delays, I am delighted to tell you that one (or more) of your pieces of art have been included in my upcoming book, The Geography of Loss: Embrace What Is, Honor What Was, Love What Will Be. Congratulations! My publishing team recently provided me with their list of selections and I wanted to let you know ASAP since I know you’ve waited a long time to hear. I am overwhelmed, as always, by the contributions of readers like you. The art submitted was stellar and, as with my other books, it was a difficult decision for the publisher to make their final selections. I’m so pleased you’re included in that group! Her art in your books will share that message in a huge way—she would be over the moon! I am over the moon on her behalf, and I keep saying out loud, Mom, your paintings are going to be published. In a book! Patti, you’ve touched my life with your books since the day you personally answered my Tweet and helped me get personalized signed copies as gifts. Verb Tribe and Project137 are ways I’ve experienced community, writing, and creativity in empowering and life affirming ways. Thanksgiving is the perfect timing to say thank you. For your books, your wisdom, your heart and soul, for walking your talk. Thank you. Truly. Madly. Deeply. 26 Nov	This entry was written by Laura and published on November 26, 2013 at 10:51 am. It’s filed under Books, Celebration, Connections, Creativity, Family, Gratitude, Laura, Lifeology, Love. Bookmark the permalink. Follow any comments here with the RSS feed for this post. So beautiful Laura! This brings tears to my eyes and reminds me again what a beautiful, generous & loving soul you are. Blessings & big vugs to you! Lisa said it perfectly, Laura…my heart is so full for you…and because of you. Your response to Patti took my breath away. Go, Mom! What a wonderful tribute to your mother, my dear friend. I am so pleased for both of you and can’t wait for Patti’s new book to be published. Who would’ve thought that when I gave you 37 Days, oh so many years ago, that it would result in this? !